The Children in Care Council is a group of young people who are all cared for by Cheshire West and Chester Council. The Children in Care Council gives children and young people the chance to shape and influence the parenting that they receive at every level, it gives young people a chance to have a say about the things that really matter in their lives, helping to shape the overall strategy for cared for children and young people in Cheshire West and Chester. The Children in Care Council meet at least once a month, we are made up of young people who live in foster care, residential homes and also young people who have recently left care. To shape and influence these changes we need to hear from as many young people as possible. Let us know if there is anything you would like the CiCC to raise for you.You can also get in contact if you would like to join the CiCC or would like to get involved in the consultation groups that we run, these are hard work but also really fun and a great way of meeting new friends and having a voice. We listen to children and young people and involve them in all decisions that are made. We enjoy what we do and our meetings are fun. We have tea before every meeting. Our meetings involve everyone who comes. Our meetings are once a month and usually on a Thursday evening. We have important people from Cheshire West & Chester who come to our meetings. We go to other important meetings. Advocates from the National Youth Advocacy Service (NYAS) attend some of our meetings. Our younger meeting starts at 5pm and our older meeting starts at 6pm and we always have breaks. We try to make things better and we are here to help you be happy. Some young people chair the meetings and take minutes. We aim to be the voice of all children and young people in care. We have written the younger and older CICC Pledges for all children and young people in care. We welcome anyone who is cared for by Cheshire West & Chester. 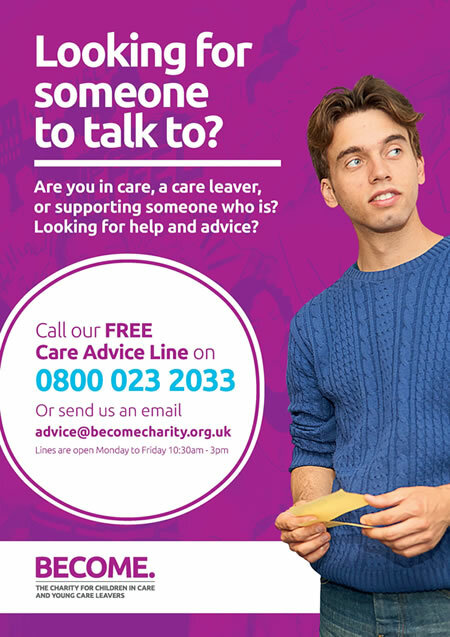 We welcome care leavers to the older group. We promise to work for you and to act for you! This leaflet will explain what a Personal Education Plan (PEP) is, why you have one, and how it can help you. Watch the Coming into Care video.